You can archive a client so that their data is preserved, but their name doesn't appear in the client list in the Connected Desktop. 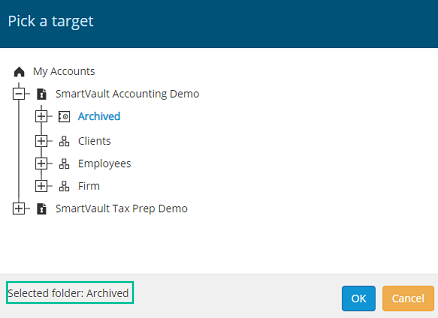 After a while, you may find that you have many inactive or former clients listed among your current clients in your SmartVault Connected Desktop. You how to archive a client in so that their data is still preserved, but their name no longer appears in your current client list in the Connected Desktop. 2. In the Advanced view, on the left side of the screen, right-click on the blue globe icon and select Create New Vault. 3. Name the vault Archived and click Create Vault. 4. On the left side of the screen, right-click on the blue globe icon and select View Dashboard. 5. From the Dashboard view, click the Files and Folder icon and navigate to the client's container. 6. 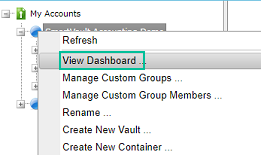 Enable the checkbox to the left of the client name for the clients you wish to archive. Click the Copy selected items icon. 7. Click on the Archived vault you created in step 2. Make sure that the Selected folder also reflects the Archived vault and then click OK. You now have a copy of the clients as folders in the Archived vault. 8. Click the clients' container once again and select the clients you wish to delete. Click the Send selected items to trash icon to delete the clients. Click OK to confirm. Note: Verify that all the inactive clients' documents have been uploaded to your archive vault before you delete the original files. 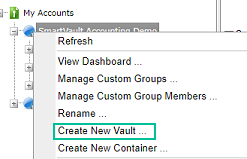 Note: You must use the SmartVault Drive to copy or drag and drop the client's vault into the archive vault because SmartVault does not let you place a vault within another vault or folder. Since Windows File Explorer displays each container and vault within your SmartVault Drive as a regular folder, you can simply copy or drag and drop these "folders" into another vault within the Connected Desktop. You may need to have that client restored with their files and access. In order to successfully restore a client, you will need to re-import the client and re-invite them to use SmartVault as a brand new customer. Re-import the client from your tax programs such as LaCerte or ProSeries. 2. 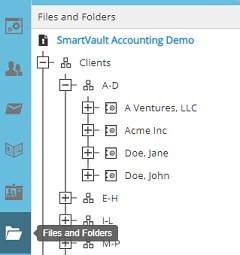 Copy and paste the old files from Inactive Clients or the archived folder you created using the SmartVault WebDrive. 3. Invite the client to gain access to their account. For more information, see Managing and Inviting Lacerte or ProSeries Tax Clients.